Santhanaladchumy Kanagaratnam, mother of Kirushna Kumar Kanagaratnam who was killed by Canadian serial killer Bruce McArthur, reacts as his friend Piranavan Thangavel speaks to reporters after McArthur was sentenced to life imprisonment in Toronto on Feb. 8, 2019. Bruce McArthur, the serial killer who preyed on Toronto’s Gay Village and murdered eight men, has been sentenced to life in prison with no chance at parole for 25 years. Imposing Mr. McArthur’s eight sentences concurrently was the lightest possible sentence available in his case. The Crown had asked for two consecutive sentences, to ensure that Mr. McArthur never again saw freedom, and that victims’ families wouldn’t have to endure a parole hearing if the killer lived to 91. But sentencing Mr. McArthur until 116 years of age would be symbolic, Justice John McMahon told the court. “There is a fine line between retribution, which is an appropriate sentencing principle, and vengeance,” he said. If Mr. McArthur had proceeded to trial or been younger, he would have had “no hesitation” imposing consecutive terms of parole ineligibility. The judge’s decision sided with the defence, who had argued that 50 years without parole eligibility would be “unduly harsh” in Mr. McArthur’s case due to his age, 67, and the fact that his guilty plea spared families from a graphic, four-month public trial. He has already served one year. That trial was originally scheduled for January of 2020, two years after Mr. McArthur was arrested. It was expedited last week when he pleaded guilty to all eight counts of first-degree murder in the deaths of Skandaraj Navaratnam, Abdulbasir Faizi, Majeed Kayhan, Soroush Mahmudi, Kirushna Kumar Kanagaratnam, Dean Lisowick, Selim Esen and Andrew Kinsman. 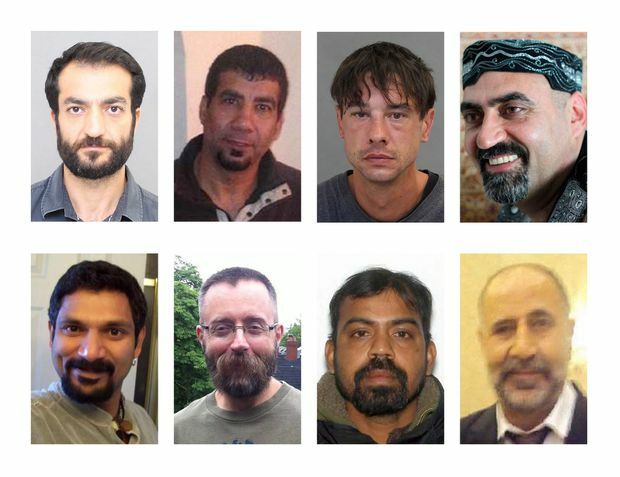 Serial killer Bruce McArthur's victims are shown in these Toronto Police Service handout photos. Top row (left to right) are Selim Esen, Soroush Mahmudi, Dean Lisowick and Abdulbasir Faizi. Bottom row (left to right) are Skandaraj Navaratnam, Andrew Kinsman, Kirushna Kanagaratnam and Majeed Kayhan. The minimum sentence for just one count of first-degree murder is a life term, with no chance of parole before 25 years, leaving Justice McMahon only to decide whether Mr. McArthur should serve his terms concurrently or consecutively. Judges have been able to impose consecutive sentences in Canada since 2011. Two of Mr. McArthur’s victims were killed earlier, making the maximum sentence in this case six consecutive life terms. Prosecutor Craig Harper had appealed to Justice McMahon to consider the vulnerability of Mr. McArthur’s victims – some were closeted, others homeless or newcomers to Canada. Many were murdered in moments of sexual intimacy. Their corpses were then posed, photographed with cigars and fur coats, and dismembered. Mr. McArthur also kept digital files for each victim. “No doubt, for his own perverted sexual gratification,” Justice McMahon said Friday. He emphasized that their deaths were slow and painful. Friday’s sentencing decision may be a “distinction without a difference,” Justice McMahon said. If Mr. McArthur was still alive at 91, the “savage nature” of his crimes would render any parole highly unlikely. “This is just the closure of one chapter, the criminal process of justice chapter,” Justice McMahon acknowledged in court, noting that family and friends had to deal with the reverberations for the rest of their lives. Lead detective Inspector Hank Idsinga, though, said his team was satisfied with the sentence, telling reporters at police headquarters that the chances of Mr. McArthur living to see any parole hearing were “between slim and nil.” Detective David Dickinson said no deal was made with Mr. McArthur to elicit his guilty plea, including on where he served his sentence within Ontario. He declined to share any information about his conversations with the admitted killer, nor how Mr. McArthur responded when caught. Probes into how the case was handled are continuing. A Toronto sergeant, Paul Gauthier, is charged by a police tribunal with insubordination and neglect of duty over an arrest of Mr. McArthur in 2016, at which time no charges were laid. An external review of how officers handle missing-persons cases, which was approved by the force’s services board last year, wasn’t supposed to include the McArthur investigation while the case was in court, but the head of the review has asked for the restriction to be lifted.